Tonight on the CW my favorite show THE VAMPIRE DIARIES airs with a whole new episode called “We All Go a Little Mad Sometimes.” On tonight’s show Terrifying hallucinations leave Elena (Nina Dobrev) shaken and confused, causing her to make a dangerous mistake. Did you see last week’s premiere episode? We did and we recapped it here for you. On last week’s show Stefan and Klaus formed an uneasy alliance to try and contain the danger that Connor (guest star Todd Williams) had unleashed on the town. When Connor took Jeremy, Matt and April (guest star Grace Phipps) hostage at the Grill, Stefan and Damon had a serious disagreement about the best course of action, and Elena was again caught between the two brothers. The situation quickly turned violent when Klaus sent one of his hybrids, Dean (guest star Blake Hood, “The Young and the Restless”) to stand up to Connor. On tonight’s show the drama continues with Elena as she copes with being a newly turned vampire. And it’s not proving to be sunshine and rainbows, folks. The transition is hard for her, and now she’ll be faced with yet another terrifying obstacle: hallucinations and visions of the past. The major question surrounding this upcoming episode will be what will Elena do as a result of these visions — what deadly, fatal mistake will she make? Elena has already made mistakes with her fangs, like almost completely eating Matt for example, so it’s no surprise that Julie Plec and the writers are going to continue making Elena’s life a living hell. In this upcoming episode we will also get to know more about Professor Shane, and his somewhat mysterious connection to the magical world. He claims not to be a practitioner, but he knows many things, and as we’ll encounter during this episode, he tells Bonnie about a strange, ancient story involving incredible witchcraft. The Vampire Diaries Season 4 episode 6 ‘We All Go a Little Mad Sometimes’ airs at 8PM tonight on the CW and we will be live blogging it will all the up-to-the-minutes. So come back to this spot and spend the evening with us enjoying the show! Make sure to refresh often to get the most current update! Tonight’s Recap: Tonight’s show opens with Elena distraught in bed. She heads down to get some coffee and hears a voice that says, “Can’t sleep?” She sees Connor covered with blood. Elena tells him he is not there and Connor tells her a guilty conscious does that. Ghost Connor asks her if it is the first time she took a human life, she calls for Jeremy. She tells Connor, he is a ghost and he attacks her and tries to twist her neck. She takes a knife and stick it in his knife and all of a sudden it is not Connor it is Jeremy. Elena calls Damon who tells her she should have called Stephen. Jeremy is on the couch and he had his ring on so he will wake back up. Stephen comes in and Damon tells Elena he called Elena. Stephen tells Elena he will help her but Elena is not interested, she knows Stephen has been working with Klaus. She is just not in the mood to talk to Stephen. Tyler comes in and Chris and Haley are drinking and Klaus is not pleased because Elena killed Connor the vampire hunter. Klaus is drinking. Caroline shows up she has brought Tyler all the stuff he bought her – they are breaking up. Klaus leaves and we find out that Caroline was lying and she did not break up with Tyler they were doing it for Klaus’ benefit. Elena is in the shower and there is blood everywhere she jumps out. Klaus calls Stephen – Stephen tells Klaus he does not want to talk to him. Klaus tells Stephen that the hunter was one of five. Klaus is concerned about Elena and asks if her hallucinations have started. He is coming over to speak to Stephen about them. Klaus tells Stephen if someone kills a hunter there are consequences. Connor’s death won’t keep him away from killing Elena. Klaus wants them to let Elena go with him and he will prevent her from taking her own life. Meanwhile Connor appears to Elena. Connor tells Elena she is a monster and she deserves to die. Connor tells Elena he is rotting in an unmarked grave because of him. Elena runs out of the house and Klaus snatches her and runs. Jeremy has a tattoo on his hand, he tells Matt is showed up once Connor died. Matt asks Jeremy if he is the next chose. Atticus Shane introduces himself to Matt, Jeremy and April. Bonnie asks Damon and Stephen if they lost Elena. Damon wants Bonnie to do magic to break the curse. Bonnie tells him the spirits won’t let her. Klaus has Elena and throws her into a room with no windows. He tells her he is going to assure she does not kill herself. Klaus tells her he went through this for 50+ years. Elena wants to know how he made it stop. Klaus tells her he did not, eventually it just stopped. He lets her know the hallucinations appear in strange forms. Stephen tells Caroline that Klaus has Elena and he needs Tyler to help break Elena out. Tyler tells Stephen that he or Chris are not sired anymore, Hailey taught them how to break out. Elena is still having visions of Connor. Connor is trying to guilt Elena out by telling her about his parents and brother. Then he starts to taunt her that her parents died because of her. Connor tells her he will not stop until she kills herself. Connor disappears and them Katherine appears. She asks Elena to have a little chat and wonders if she missed her. April remembers how she remembers Atticus Shane, her Dad knew him when he taught theology at Whitmore College. Shane is lecturing at Mystic High for an exposition he is showing. Bonnie is going to get him to come and see Damon. Katherine is now taunting Elena – she tells her she is a vampire and she is going to kill again and be just like her. Elena goes to attack her and ends up attacking the bed. Bonnie brings Shane to meet Damon – Shane recognizes Damon as someone who audited his class. Damon gives Shane a document that has the picture of the tattoo Connor had on him. Shane recognizes it as the hunter’s tattoo. Shane tells Damon that the legend says that if a hunter is killer by the person they are hunting that person walks the earth haunted until the next hunter shows up. Damon calls Jeremy. Caroline comes to see Klaus she tells Klaus she wants him to give Elena back. Klaus tells her she cannot because Elena needs his help. Klaus tells Caroline if Tyler was sired to him he would never have let him hurt her. 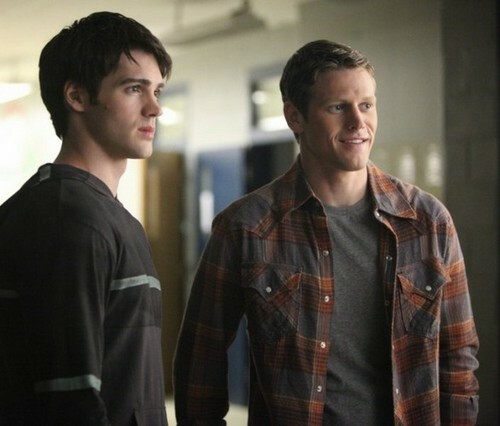 Tyler tries to convince Chris to let Stephen see Elena. Tyler tells Chris that Hailey and him will protect Chis if Klaus comes after him. Katerine continues to try to convince Elena to kill herself. Chris comes down to where Elena is being held and gets rid of the two guards and lets Elena in. When Elena sees Stephen she thinks it is Connor and she attacks Stephen with a metal post. He falls and she runs out the door. Jeremy comes in and Bonnie tells him they figured out how to help Elena, Jeremy has to kill a vampire. Jeremy agrees, he will kill Damon right away. Damon calls Stephen and lets him know they found out how to help Elena. Stephen tells him it is too late he lost Elena. Caroline comes clean with Klaus and tells him he was distracting him while they broke Elena out, but now they have lost her. Klaus is furious, Caroline calms him by telling him they know how to help Elena. Meanwhile, Elena is running around and having hallucinations – she is at Wickery Bridge. Her mother appears and tells her that she knows exactly what to do – Elena looks at her ring and her mother implies she should remove her ring and let the sun come up. Elena agrees she should die, because she is a monster……Elena takes the ring off and drops it in the water. Elena stands at the bridge and says she cannot do it, she cannot leave Jeremy. Her mother tells Elena he will have her as a ghost, not as a monster. Elena apologizes to her mother for disappointing her. Her mother tells her she was everything he ever wanted, but she died and she was supposed to stay dead. Damon walks up to her. He tells her it was easy to figure out. She tells Damon he was right vampires kill people, she cannot live with herself. Damon wants her to go with him to talk before she does something stupid. Meanwhile Connor appears and tells her it is almost over. Damon sees that Elena’s ring is missing. Klaus walks into the house where Chris is and starts to strangling Chris. Tyler tells him it was his fault and Klaus should kill him and then Hailey tells Klaus it was her and she would rather die than be sired to him. Chris goes to walk out and Jeremy walks in and kills him, Stephen is behind him and he apologizes. Jeremy takes an ax and kills Chris. The vampire hunter tattoo gets bigger and now Jeremy is the apprentice Vampire Hunter. Elena does not see Connor anymore; she tells Damon he is gone. The sun is coming up and Elena does not have her ring. Damon takes her and jumps in the water under Wickery Bridge. Elena is in bed and she has her ring back. Damon tells her he fished it out of the river for her. Damon asks her how she feels. Her head is clear now, it seems like it was a bad dream. Elena thanks Damon for saving her, she holds his hand.. Damon tells her he is about to take a very high an annoying road. He tells Elena that Stephen has been lying to her, but everything Stephen is doing is to help her. Damon tells her there may be a way out of it for her, there may be a cure. Caroline comes and sees Tyler drinking to toast Chris. Tyler wants to know how Caroline got Klaus to agree to give up one of his hybrids. Caroline tells Tyler she agree to go on a date with Klaus. Tyler smashes his bottle of liquor – he tells Hailey he is celebrating the life of his hybrid friend. Damon is at the bar and he tells Damon that Shane knew April’s father and he thinks that is creepy. He had the Sheriff check into the pastor and saw the pastor called a number every day and on the day that they pastor blew everyone up he called a number 10 times and that number was Atticus Shane! Atticus asks Bonnie if Damon got everything he wanted in his files. Bonnie asks Atticus Shane how he knows everything. Shane claims he studied all. Shane tells Bonnie when Jeremy completes his mark as the vampire hunter she will have to go to him because he is the only one that can help. Elena apologizes to Stephen for stabbing her. He tells Elena he know Damon told her all. Elena asks Stephen why she sent Damon to look for her. Stephen replies because lately she seems to trust Damon more and can talk to him more. Elena tells Stephen she loves him for fighting for a cure for her. She thinks what she has become is darker and different. Stephen asks her if who she wants is different. Elena tells Stephen that something has changed between Damon and her. All her feeling have been magnified since she became a vampire. She apologizes to Stephen and tells him she does not want to lie to him.